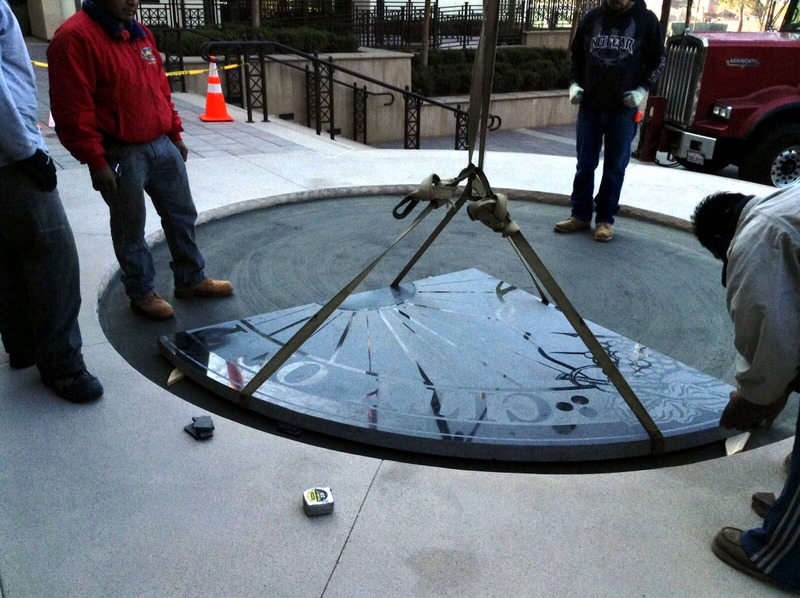 The city is replacing the large brass and granite mosaic seal at the Civic Center’s main entrance, a handsome piece of work that ended up being a slick annoyance. It is being replaced with a new seal made entirely of dark grey rock known as Imperial granite. Mined from a San Marcos quarry, it was delivered to the engraver, Sun City Granite of Perris, on Monday. The old mosaic featured polished granite and brass cut-out elements, including two grape clusters, the bust of a Native American and a stagecoach. When it rained, the surface of the seal became very slick, creating a safety hazard for pedestrians. To prevent people from walking over the seal, the city put safety cones around it during wet weather. Temecula Assistant Manager Greg Butler said the city attempted to solve the problem by sandblasting the surface of the seal, which he estimated to cost the city roughly $20,000 to $25,000. “It was simply observed that shortly after the mosaic was treated for the slippery wet surface, the summer heat caused the brass cutouts to expand, bow and break the surrounding granite,” Butler said. Butler said it will cost about $19,000 to replace the seal and the money to pay for the work is coming from the city’s public art fund that is fed by development impact fees. The city is not seeking to recover the costs associated with the original installation because it was put in as per the original design. “We are not seeking to recover any costs from the designer either,” Butler added. “We cannot be certain what caused the brass pieces in the original mosaic to begin to expand and contract so dramatically after the sandblasting treatment.” Work on the replacement seal is scheduled to begin Feb. 17, when City Hall will be closed for Presidents’ Day, said Bruce Wedeking, the city’s maintenance supervisor. 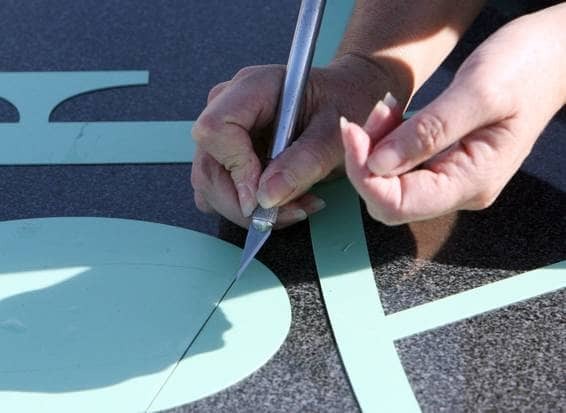 Teresa Herbers, an owner of Sun City Granite, said the design of the new seal — which will weigh around 3,500 pounds –, should eliminate the slipping issues. 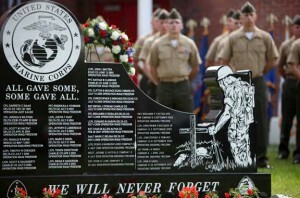 “We made a point to make most of the granite engraved so it had a rough texture,” she said. “We were very careful about that.” When the $70 million Civic Center was unveiled in late 2010, flourishes that elicited “oohs” and “ahs,” according to published reports, were the large video screen in the council chambers, the mosaic artwork that hangs in the hallway leading to the chambers and the seal. A huge chunk of Imperial granite mined from a quarry in San Marcos. Crushed garnet trucked down from the Pacific Northwest. Elbow grease and sweat supplied by the owners of Sun City Granite in Perris. 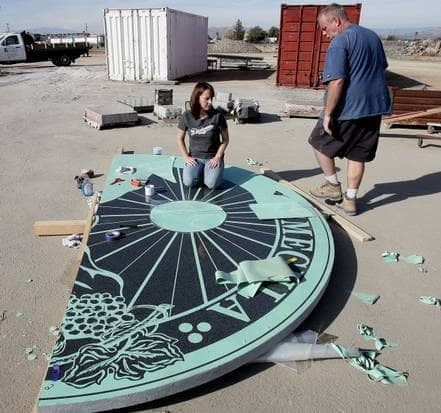 All these Made in the U.S.A. elements are coming together to create a new city seal that will be set in front of the main entrance to Temecula’s Civic Center, which opened with fanfare in late 2010. “It’s going to be really impressive when it’s done,” said Joe Mehochko, co-owner of Sun City Granite. 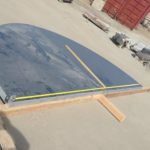 Mehochko – his face, hair, pants and baggy shirt covered in crushed garnet – spent three hours on Thursday, Feb. 13, personally sandblasting one of the four pie-shaped wedges that will form the new seal. He’s going to spend equal time on each of the other wedges as well. To create the seal pattern, Sun City used a printer — Mehochko noted it was also Made in the U.S. — to create the stencil that is set on the granite. 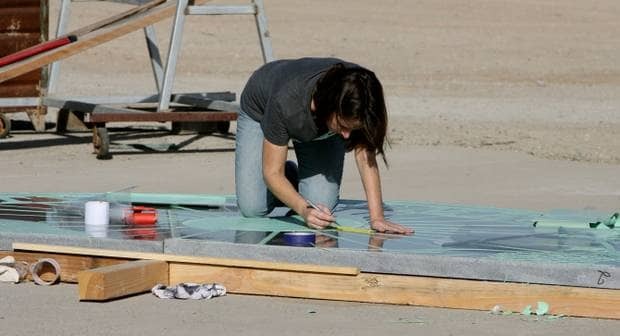 The adhesive on the stencil, applied by Sun City co-owner Teresa Herbers, bonds with the granite and allows it to withstand crushed garnet pumped out at 120 pounds per square inch. 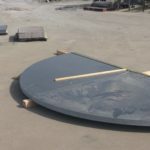 Sun City is doing the sandblasting by hand because the automatic sandblasting machine that it uses for headstones is not large enough to accommodate the huge wedges that will make up the 3,500-pound seal, which will be 12-feet wide when assembled. The original seal – which featured large brass cut-out elements of grape clusters, the bust of a Native American and a stagecoach – cost around $20,000. It was praised for its appearance but it quickly became a headache for the city. During rainy weather, the surface became slick and the city had to put safety cones and warning signs around it: not a particularly positive first impression for a $70-million building designed to be the focal point of a revitalized Old Town. To create a tacky surface and make the seal safe to walk on, the city brought in a sandblasting crew. Shortly after the seal was blasted, however, the brass pieces started to pop out of place and the granite started cracking. Assistant City Manager Greg Butler said the city did not seek to recover the costs associated with the initial installation because it was put in according to all specifications. And the city was not able to determine if it was the sandblasting that damaged the seal or abnormal weather conditions. The city eventually removed the brass elements, creating an odd looking piece of work that sat atop the steps of City Hall for months. On Presidents’ Day, while City Hall is closed, crews will be jackhammering the old seal out and creating a pad for the new work. Butler said it’s going to cost around $19,000 to complete the job, which includes the money paid to Sun City Granite. The new seal should stand the test of time, Mehochko said. “You could drive a car over it!” he said. Sun City is hoping to have the new seal placed and set by next week, possibly as soon as Wednesday. 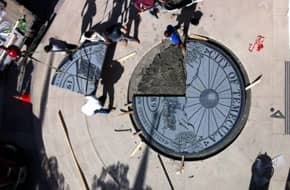 As the wind whipped the trees and Rod Run banners in the Town Square and rain poured down on the center, water beaded atop the new city seal without turning the 12-foot wide circle into a slip ‘n’ slide. The old seal, which was unveiled along with the rest of the $70 million Civic Center in late 2010, featured a combination of slick granite and brass cutouts of a Native American bust and a stagecoach. During wet weather, it became so slippery that when it rained, the city took to placing safety cones and caution signs around it. To rectify the slipping issue, the city brought in a sandblasting crew. After the work was done, however, the granite began cracking and the brass cutouts popped out on hot summer days. On Presidents’ Day, a crew jackhammered out the old seal to make way for the 3,500 pound, all-granite seal that was etched by Sun City Granite in Perris The new seal was sandblasted with crushed garnet to give the entire surface a tacky feel that should prevent a slipping accident. “I think it’s ‘done,’” said City Manager Aaron Adams, fielding questions on the seal before heading into a lunch event with the mayor at the center’s conference center on Friday. Maryann Edwards said she is happy with how the seal turned out and she personally checked out the surface by shuffling atop it to test its grip. 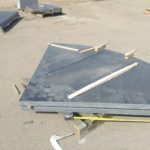 To create the pattern, Sun City Granite used a printer to create a stencil that was applied to the four pie wedges of granite that make up the seal. The surface was personally sandblasted by one of the co-owners of the company. Post by Sun City Granite Grave Markers and Headstones.